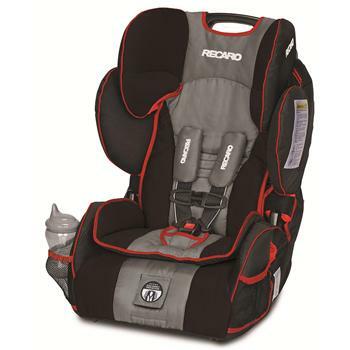 Recaro Child Seat - Performance SPORT - Dezod Motorsports Inc - Home of the automotive performance enthusiast since 2002. The RECARO Performance SPORT Combination Harness to Booster Car Seat has all-new features such as HERO harness system technology and cloud comfort memory foam. HERO is a new, exclusive and innovative safety feature by RECARO. HERO ensures the highest level of protection and comfort by positioning the shoulder pads to appropriately fit the child’s neck, head and shoulders while resisting harness twisting and ensuring proper chest clip positioning. The Performance Series includes the RECARO Safety Stripe System, which is a racing-inspired white stripe that is clearly visible on the outside edge of the 5-point harness. This stripe is designed as an easy alert to parents that a twist could occur, or has begun, thus preventing a safety hazard. Additionally, all-new features include added mesh for breathability, improved comfort pad with memory foam, enhanced cup holders and stylish trim details. The Performance SPORT Combination Harness to Booster Car Seat has twist- resistant straps and a 5-Point harness system that accommodates children 20 to 65 pounds in harness mode and 30 to 120 pounds in booster mode. The Performance SPORT incorporates RECARO Side Impact Protection technology inspired by four decades of racing seat safety.